According to data from the United Nations, Haiti is the poorest country in Latin America, and one of the poorest in the world. More than 6 million people, 59% of Haiti’s population, live below the national poverty line of $2.41 per day, and more than 2.5 million (24%) fall below the national extreme poverty line of $1.23 per day. Due to its geographic location — the country is situated between two major fault lines within the zone commonly referred to as “Hurricane Alley” — Haiti is extremely vulnerable to natural disasters including hurricanes, floods, and earthquakes. Over the past decade, Haiti has suffered from several natural disasters that have set back the country’s social and economic development. First, in January 2010, a magnitude 7.0 earthquake killed more than 230,000 people, injured 300,000, and displaced 1.5 million people. More than 20% of the country’s population was affected, and GDP contracted 5.5% with approximately $8 billion in damages. In October 2016, just as the country was truly beginning to recover from the earthquake, a Category-4 hurricane decimated the southern part of the island, causing more than 1,000 deaths, injuring and displacing thousands more, and causing damage equivalent to 32% of Haiti’s GDP. Later that year, a devastating cholera outbreak spread across the country — the official death toll rose to at least 9,500 as time passed. Despite the unfortunate frequency of natural disasters in recent years, Haiti continues to rebuild with the help of international aid organizations, socially minded investors, and social enterprises dedicated to the development and success of the Haitian people. 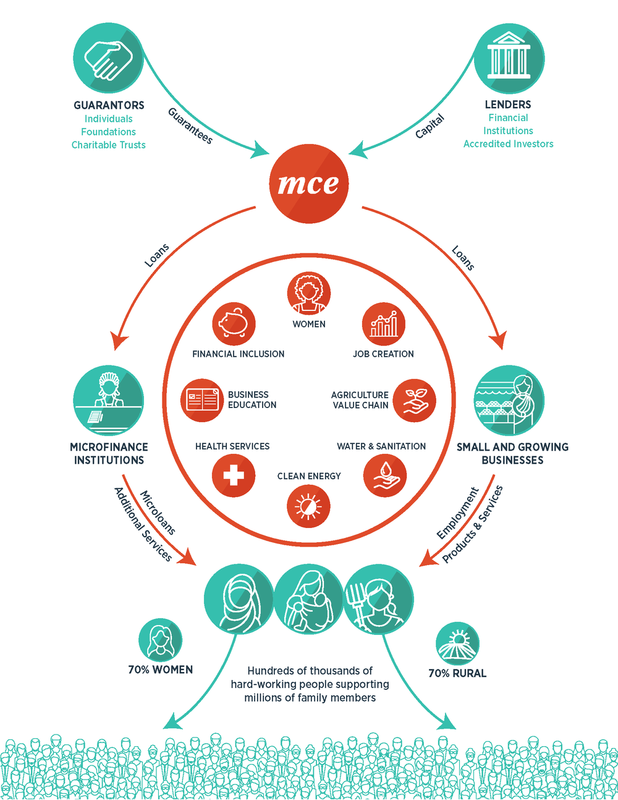 MCE Social Capital, a U.S.-based nonprofit impact investing firm with tremendous experience investing in developing countries around the world, made its first investment in Haiti in 2013. With its pioneering loan guarantee model, MCE knew that underutilized capital from the U.S. and Europe could be used to catalyze social enterprises in Haiti that were working to improve the lives of the poor and promote community resilience to future economic shocks. The first of MCE’s investments in Haiti was a $200,000 investment in a microfinance institution called Fonkoze. Fonkoze’s mission is to empower Haitians—primarily women—to lift their families out of poverty through the provision of financial and non-financial services. In addition to its portfolio of various loan products, Fonkoze offers business education and financial literacy training as well as health programs for its borrowers. Following its initial investment in 2013, MCE disbursed a total of $500,000 to Fonkoze in 2016 as the organization continued to grow and positively impact the lives of the poor. Today, Fonkoze is the leading microfinance institution in Haiti, with a portfolio of over $20 million serving more than 65,000 borrowers through 45 branches across the country. In September 2017, MCE made a $300,000 investment in DLO Haiti, Inc., an innovative water purification and distribution business founded in 2013, which aims to develop a sustainable and scalable model to access clean water in Haiti. DLO builds and operates local, community-scale water treatment centers in rural and peri-urban areas throughout Haiti, distributing more than 14,000 gallons of clean drinking water to over 35,000 beneficiaries per day, at a price well below the lowest priced alternative. DLO’s kiosks also act as distribution points for a variety of essential consumer goods, such as soap, toilet paper, and powdered milk, which are often unavailable in underserved areas. MCE is proud to support Fonkoze and DLO along with other Haitian organizations creating sustainable social impact for underserved and vulnerable communities throughout the country. But Haiti is just one country in MCE’s global portfolio spanning Latin America, Africa, Asia, Eastern Europe, and the Caucasus. Philanthropic guarantees enable MCE to leverage the excellent credit of high net worth individuals and foundations (its Guarantors) to borrow capital from U.S. and European financial institutions and accredited investors. MCE then strategically deploys that capital into the developing world. This unique model is highly effective not only for financing MCE’s portfolio companies, but for maximizing each dollar that is guaranteed by MCE’s community of over 100 Guarantors, who agree to share the cost of any default in MCE’s portfolio pro rata. An MFI Guarantor who joined in 2006 has personally enabled over $4,400,000 in disbursements to MFIs across the developing world. Compared to the total charitable gifts that same Guarantor has made to MCE since 2006 of $38,500, the multiplier effect is huge. For that Guarantor, every $1 gifted to MCE has enabled $114 of impact! In addition, the capital has supported over 13,000 loans from MFIs to end borrowers, positively impacting the lives of more than 40,000 people. IFC is a nonprofit in partnership with the Sustainable Endowments Institute and the Sustainability, Ethics, and Entrepreneurship (SEE) Conference, led from Colorado State University.